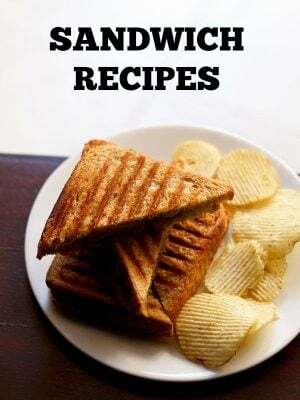 pressure cooker recipes – sharing a collection of recipes that can be made in a pressure cooker. cooking in a pressure cooker not only saves time, but also energy and fuel. nutrients are also preserved when cooking food in pressure cooker. most of us use pressure cooker to cook rice and lentils or steam veggies. but a pressure cooker can also be used as an oven. 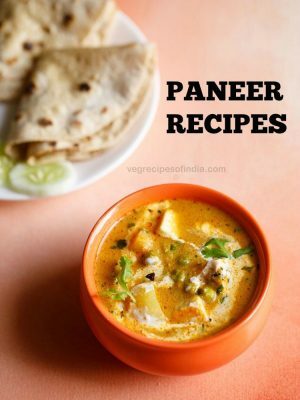 in this collection i have shared recipes that are often made using a cooker and also recipes that are generally not made in a cooker like – cakes, breads, biryanis. 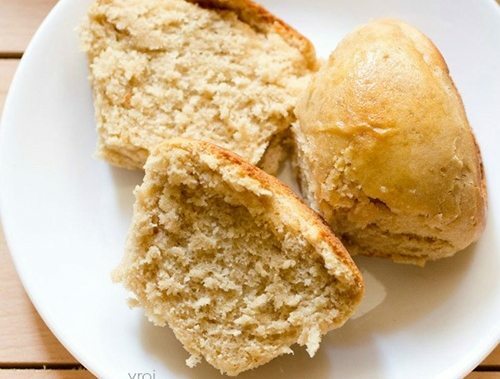 if using pressure cooker for baking, then keep it for baking only. do not use it for pressure cooking or steaming. 1. eggless chocolate cake recipe – the chocolate cake made in a pressure cooker is soft, moist and light and tastes like dutch truffle cake. basically this cake is best had directly from the pan. i have also shared collection of 21 chocolate recipes. 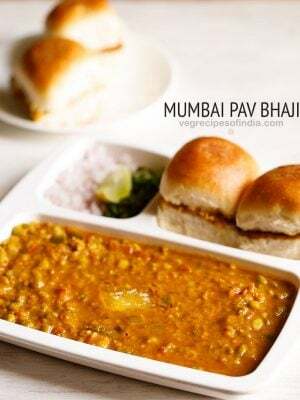 2. pav bhaji recipe – quick and easy method of preparing delicious pav bhaji using pressure cooker. a one pot recipe. 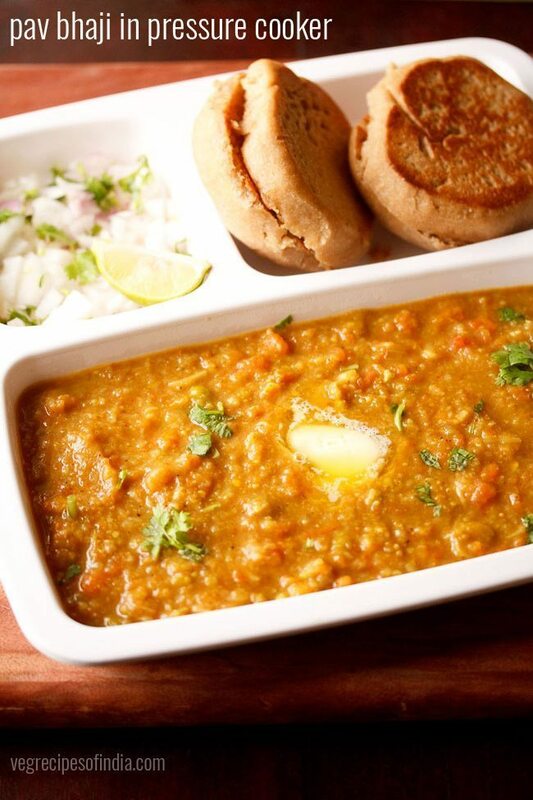 if you have time then try this delicious mumbai pav bhaji recipe. 3. vegetable biryani recipe – easy recipe method of a biryani made in pressure cooker. no pre cooking of veggies and rice required in this recipe. 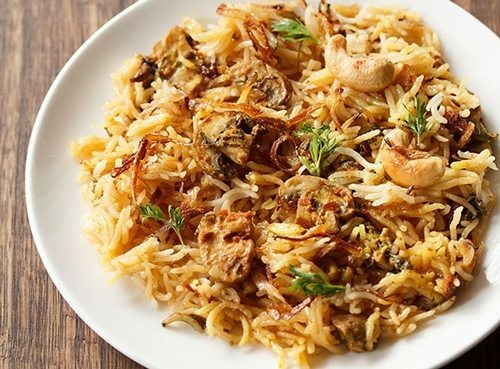 if you have time for making elaborate biryani then you can check this hyderabadi veg biryani recipe or this collection of 26 biryani recipes. 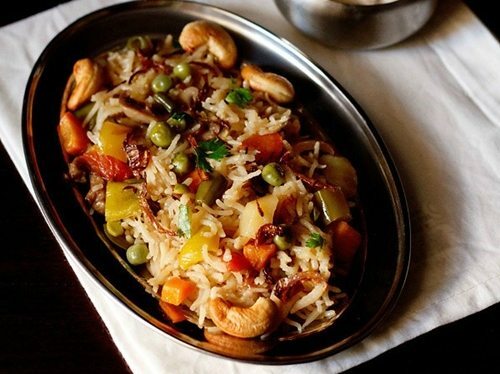 4. vegetable pulao – veg pulao made in pressure cooker. quick and easy recipe of a comforting one pot meal, when we don’t have time to do elaborate cooking or we have to cook food on a short notice or in a quick time. 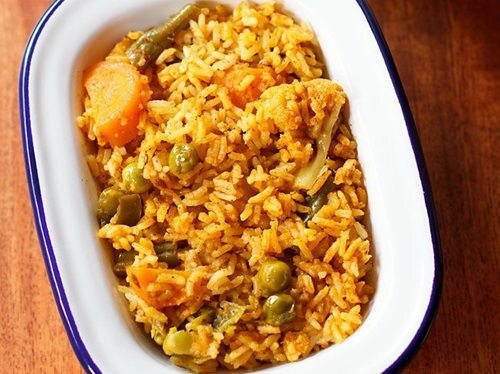 if you want to make pulao in a pot or pan then you can check this spicy vegetable pulao or this pulao recipe. 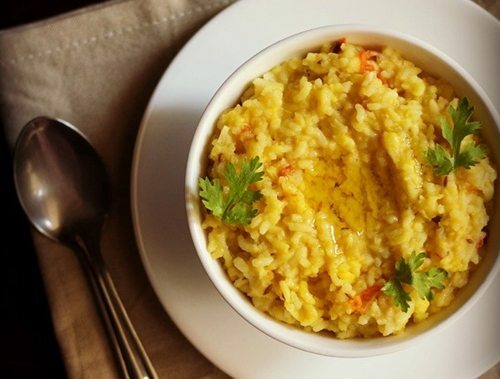 5. khichdi recipe – one pot meal of rice and moong lentils. light and easy to digest meal. few more khichdi recipes, i make in pressure cooker are palak khichdi, dal khichdi and masala khichdi. 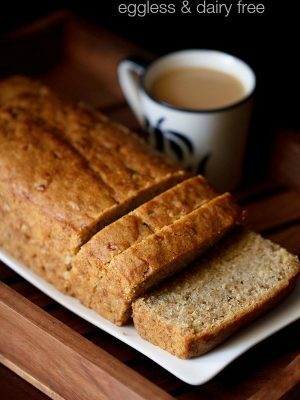 6. cake in pressure cooker – spongy and a soft, light textured delicious cake made in pressure cooker. 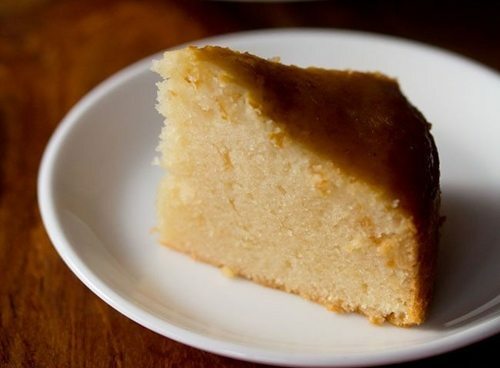 this recipe of sponge cake is also very easy. no beating and no whipping required. 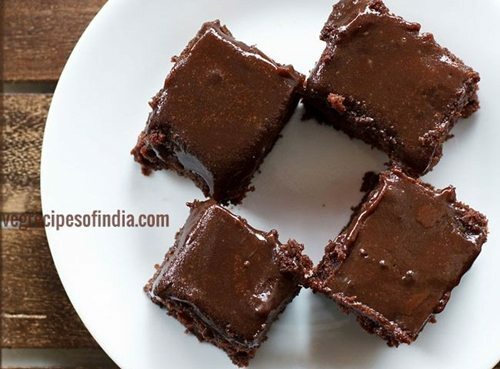 if you love eggless baking then have a look at this collection of top 10 eggless cakes recipes. 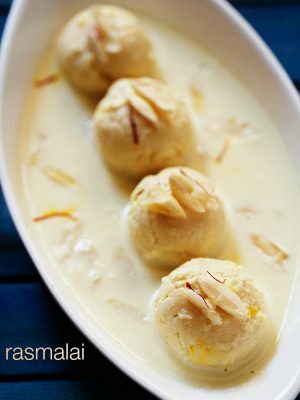 7. ladi pav in pressure cooker – indian bread rolls also called as pav or pau. this recipe method shares how to make the pav in a pressure cooker. 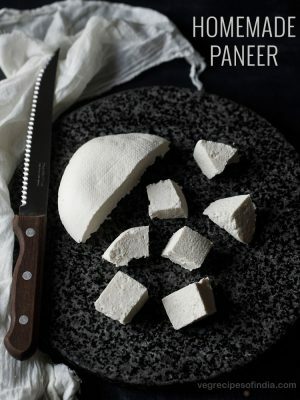 pav is usually served with misal pav, pav bhaji and vada pav. 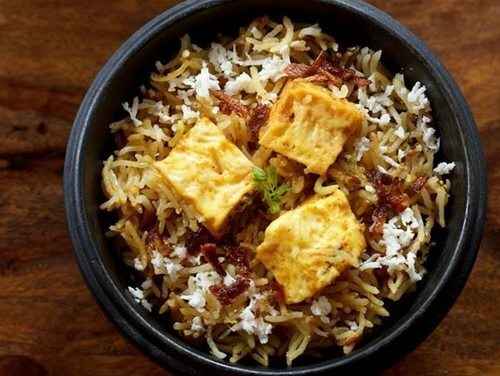 8. paneer biryani in pressure cooker – a relatively easy recipe of preparing paneer biryani in pressure cooker. this biryani is layered and has the flavors of a dum cooked biryani. no pre cooking of gravy or rice. 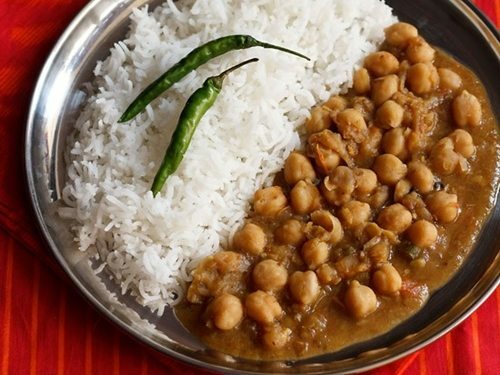 9. easy chole recipe – this one is an easy chole recipe and does not require chana masala spice blend or powder. you also don’t need to make this spice blend at home. 10. coconut milk rice – mild, fragrant pulao made with coconut milk and mixed veggies. 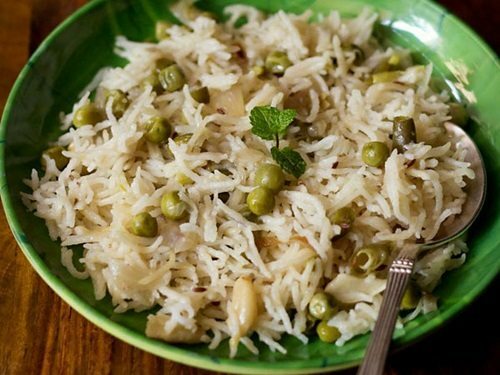 the coconut aroma and flavor along with the fragrant spices does make this pulao different from the regular pulaos. 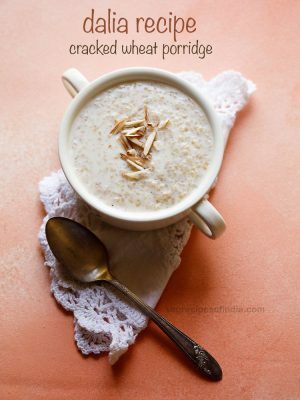 so when you want to add some richness and flavor to your food, add coconut milk. 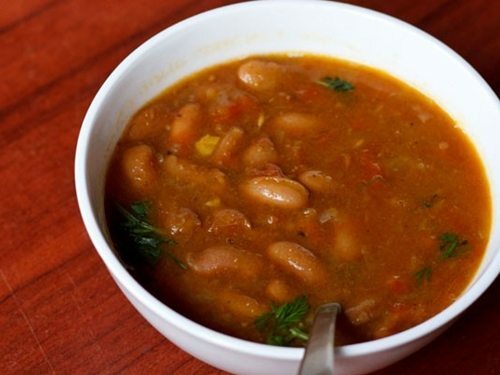 11. rajma recipe – simple and easy one pot punjabi rajma masala or kidney beans curry. if you are looking for restaurant version then check this rajma masala recipe. 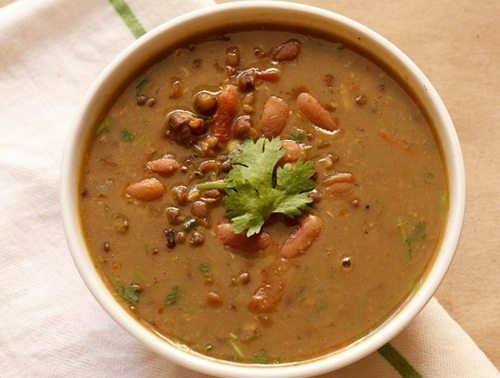 12. easy dal makhani recipe – this is the simplest & easiest version of making dal makhani. this is a one pot method where all the ingredients are thrown in and then cooked together. 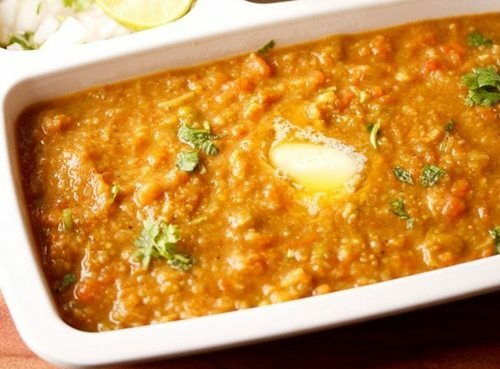 if you are looking for restaurant version then check this dal makhani recipe in which dhungar method is used. 13. mushroom biryani – easy and delicious recipe of mushroom biryani in pressure cooker with step by step photos. 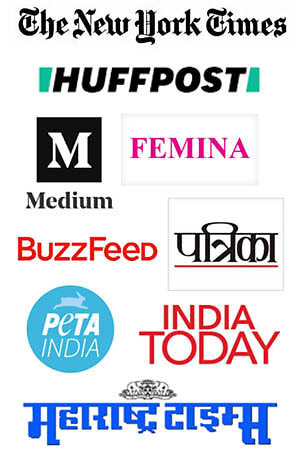 the biryani has dum cooked flavors. no pre cooking of rice and gravy required. 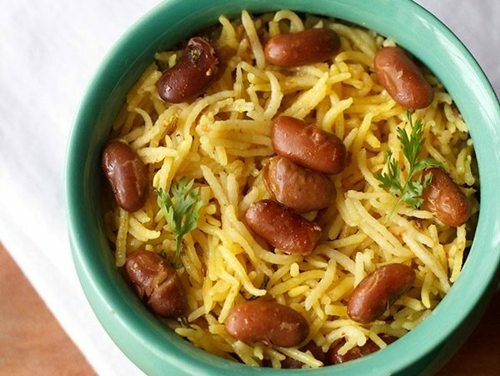 14. rajma pulao recipe – in this recipe both the rajma (kidney beans) and rice are cooked in a pressure cooker. first the rajma beans are cooked and then the rice. 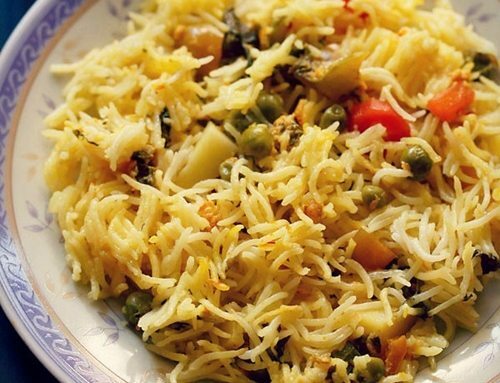 if you like pulao, then i would suggest you to check this collection of 28 pulao recipes. 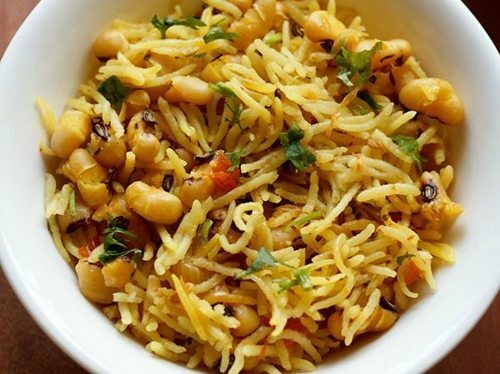 15. lobia pulao recipe – pulao made with black eyed beans, onions, herbs and spices. this is a homely version and not a spicy pulav. i have cooked everything in a pressure cooker. 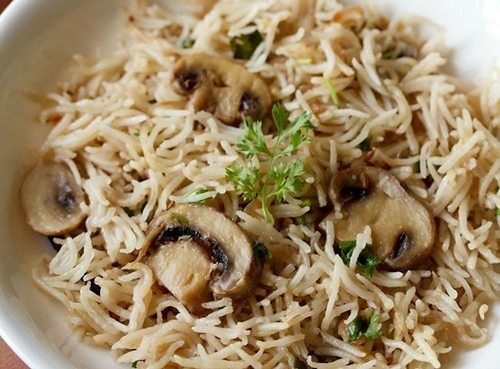 16. mushroom pulao recipe – simple and easy recipe of mushroom pulao made in pressure cooker. 17. south indian vegetable biryani recipe – spiced one pot recipe of vegetable biryani made in pressure cooker with step by step photos. 18. gajar halwa in pressure cooker – easy and a less time taking recipe of preparing gajar halwa in pressure cooker. 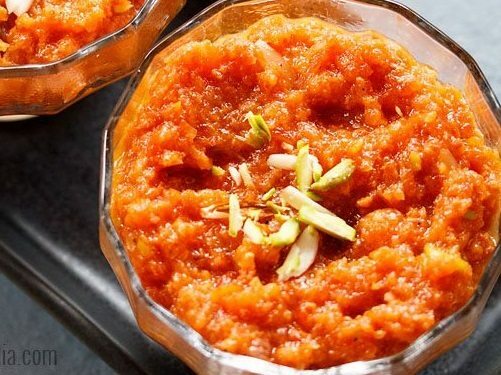 you can also check this traditional method of making carrot halwa. 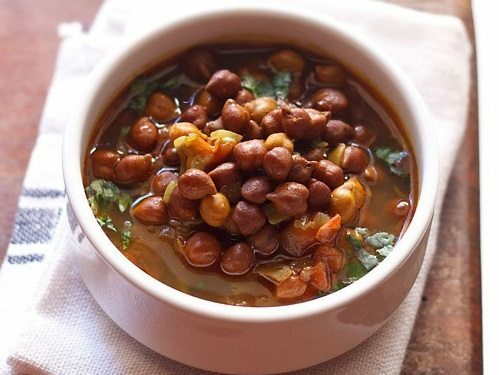 19. kala chana recipe – this simple punjabi curry is very easy to make and yet flavorful. basic ingredients like onions, tomatoes and garlic along with the regular indian spices go into it. this delicious black chickpeas curry is made quite often at home. another variation is this dry kala chana recipe which is also made in pressure cooker. 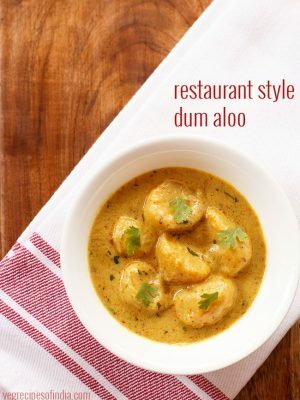 20. aloo matar recipe – a simple punjabi style aloo matar gravy which we often make at home. 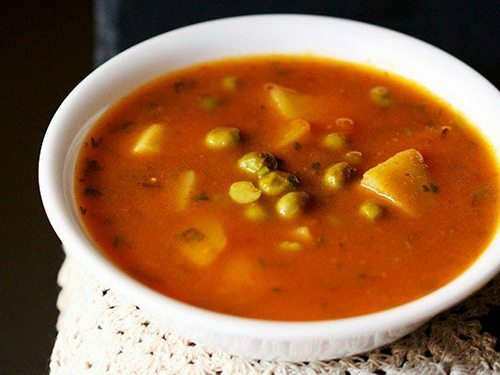 the recipe is an easy home style potato peas curry and not a restaurant style dish.